Wolves' defensemen Shemar Pearl (#6), Jared Brumfield (#23), Jacob Stephens (#2), and Tabron Yates (#48) look to the sideline for a playcall. 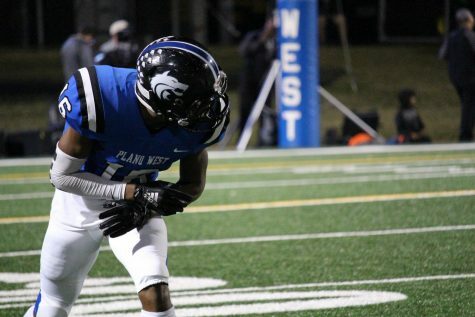 The Plano West football team will play their final game of the 2018 season tonight. Standing in between them and the end of their season, though, is their toughest opponent of the year—Allen. To nobody’s surprise, the Allen Eagles have had yet another impeccable (and undefeated) season, going 9-0 through week 10. Allen’s last loss was in the 2016 6A championship game, where they were surpassed by The Woodlands by a score of 36-28 at Darrell K. Royal Stadium in Austin, Texas. MaxPreps’ national ranking system has Allen listed as the best team in the state of Texas and the 11th best team in the nation. Along with the Eagles, three other Texas teams are in MaxPreps’ top 25 teams in the nation: Longview at 12th, North Shore at 15th, and Aledo at 16th. Cannon, who has replaced quarterback Danny Davis in the past two games due to injury, threw for 117 yards and one touchdown in last week’s 51-17 loss to Plano East. Since taking over the starting job at quarterback, Cannon has totaled 287 yards passing yards, 70 rushing yards, two touchdowns (one passing, one rushing), and four interceptions on 30 completions. Running back Noah Scroggins also played well last week, rushing for a career-high 157 yards. Scroggins has rushed for 627 yards and three touchdowns on the season. 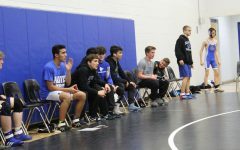 For Plano West, though, tonight’s game is more than just a score when it’s over—it is also a look back on all of the memories and moments the team has had together—especially for the seniors, as most of them will be suiting up in a Plano West uniform for the last time. That being said, it’s just another day at the office for Coach Smith and the team, and playing against Allen is no different. Though playing against Allen is just like any other week, they will have to plan a day ahead, as their game is tonight instead of Friday. Allen is coming off a dominant 54-21 win against Prosper last week. QB Grant Tisdale torched Prosper’s defense, throwing for 174 yards and a touchdown and leading Allen in rushing with 162 yards and three rushing touchdowns. Tisdale has thrown for 1,565 yards and 22 touchdowns this season. He also leads the Eagles in rushing with 719 yards and eight rushing touchdowns. Tisdale has only thrown three interceptions this year. Allen running backs Raylen Sharpe, Celdon Manning, and Grant Robinson all rushed for one touchdown of their own against Prosper, and tallied 111, 98, and 86 rushing yards, respectively. In total, Allen recorded over 600 yards of offense while holding Prosper to just 206. Manning is second on the team in rushing behind Tisdale with 717 yards and 10 rushing touchdowns, and Raylen Sharpe is third with 455 yards and seven touchdowns. Tonight’s game will be nothing short of an uphill battle, though, as Allen is averaging over 50 points and just under 500 offensive yards per game while holding their opponents to an average of 14 points and 214.7 yards per game. 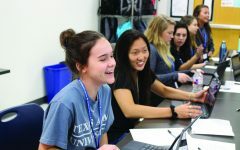 “I think [the seniors] will do great just like they’ve done all year long, and just like they did last Friday night [against Plano East]. 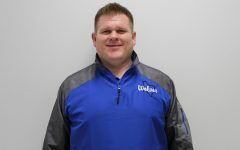 The last time they get to step on the field and play a game as a Plano West football player is big for them.” — Head Coach Scott Smith on the importance of tonight’s game for the seniors. Senior wide receiver Leon Green (#16) on the line of scrimmage before a play. Plano West has a -262 point differential, while Allen boasts an impressive +327 point differential. Allen and Prosper have both successfully clinched playoff spots regardless of whether or not they win this week, even though Prosper was defeated by Allen in week 10 last Friday night. With both “Eagles” teams securing playoff spots, only two sports remain for three teams still in the hunt. Plano East and Plano Senior can also both advance to the playoffs if they win their games tomorrow night, leaving McKinney as the odd-team out. 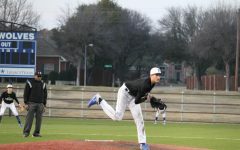 East plays Jesuit, and Plano Senior hosts Prosper. In order for McKinney to make the playoffs, they would have to beat McKinney Boyd, as well as have Prosper defeat Plano and Plano East beat Jesuit. 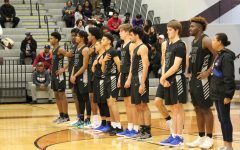 Plano East does have a tie-breaker, though, but that could be broken on a point-differential if it ends in a three-way tie between them, McKinney, and Plano. 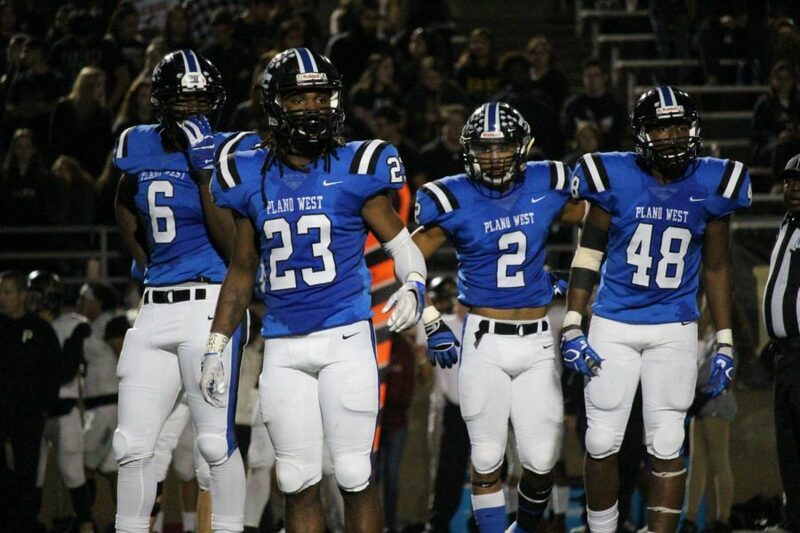 Plano West will start their last game of the year against Allen at Eagle Stadium at 7 p.m.